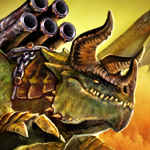 Blast your enemies out of the air in an epic free-to-play, dragon-themed shooter! Dragons of Elanthia is a multiplayer third-person shooter in which players select different dragons and riders, each with unique abilities, to fight it out over the skies of a world wracked by uncontrolled magic. The game features an ever expanding roster of dragons and riders in a variety of fantasy battle arenas. Today’s blog post features the newest addition to our team of riders: The Gladiator.He’s just as fierce as he looks, and is a powerful single-target damage-dealer. The Shaman is featured in today's rider preview. And while he may look a little silly, don't be fooled: his hexes and voodoo are formidable. In today's rider preview, we take a closer look at The Mage, whose attacks are treacherous from afar and equally deadly in close combat. The Behemoth is a massive beast who can attack multiple targets simultaneously with his shockwave and missile barrage abilities. He's the ultimate tank of Dragons of Elanthia. In today's post, sound designer Adam Shaw describes the process of finding and creating sounds for Dragons of Elanthia, including the equipment he uses and some unusual inspirations for his work. Ever wondered how game characters are created? Our talented team of artists show you, step by step, how a character evolves from a rough concept sketch to full animated implementation in Dragons of Elanthia. Our newest game mode, Siege, features one team on offense and another defense as they attempt to destroy or secure a castle! No tricks, all treats: The Dragons of Elanthia team wishes you a safe and happy Halloween! Dragons of Elanthia on Kickstarter! Our Kickstarter campaign is now live! 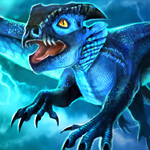 Visit our page and help us complete Dragons of Elanthia! 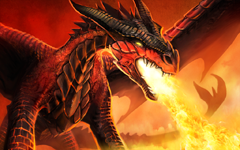 We are absolutely thrilled to announce we have listed Dragons of Elanthia on Steam Greenlight. The response from the community has been strong and we love hearing how excited everyone is to see a Aerial Dragon dogfighting MOBA style game become available. Vote for Dragons of Elanthia on Steam Greenlight today! The Lightning Drake darts around the battlefield with ease, confounding its enemies with superior speed and zapping them with bolts of lightning. One of the most maneuverable dragons in the game, the Lightning Drake is the perfect choice for infiltrating the cracks in your enemies’ defenses. We took Dragons of Elanthia to PAX Prime last week, and received some nice attention from several members of the press, including The Escapist's Josh Vanderwall, Landon Robinson from Machinima's Inside Gaming Daily, Total Biscuit (The Cynical Brit) and Megan Farokhmanesh with Polygon. Read on to find out what they thought about the game! The fire drake draws on ancient, primal magic, channeling that energy into its allies to recharge their endurance over time. It also has a classic fireball for a breath weapon, which will handily blast fragile foes out of the air. Welcome to Dragons of Elanthia! Simutronics is very excited to FINALLY reveal our latest game, Dragons of Elanthia. The game is all about high-flying dragon-based PvP in a wide range of ridiculously cool environments, and we hope you’re as excited about it as we are! Initially we’ll have six dragons and six riders, with the ability to mix and match them so that there’s a combination for everyone's play style. We’ll also have several awesome maps for you to hone your flying skills and practice your aim. Because after all, you're riding a freaking dragon, so it might take a little while for the shock to wear off. In the coming weeks we’ll be telling you more about the game, including details about the dragons, riders, gameplay, environments and other cool features that we can’t talk about just yet. We’ll also give you a behind-the-scenes look at the development process, with developer insights and stories so you can learn more about us, too! For now though, check out the rest of the site, let us know what you think, and while you’re here don’t forget to sign up for the beta so you can see for yourself!